Best choice for dry mead. Used in many award winning mead's. Low foaming with little or no sulfur production. Buy now! Best choice for dry mead. Used in many award winning mead's. Low foaming with little or no sulfur production. 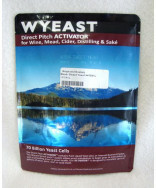 Use additional nutrients for mead making. Recommended for: Mead, Fruit Mead, Herbal Mead, Dry Ciders and Cysers. Flocculation: low-medium, alcohol tolerance: 18%, residual sugar: 0-0.25%, 55-75 deg. F.